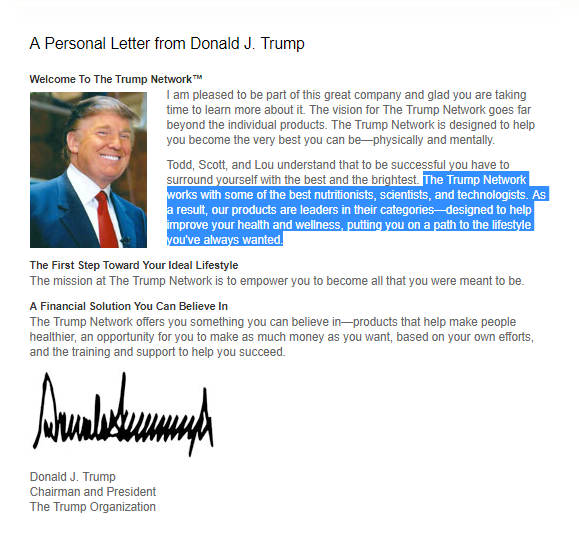 The Trump Network was born in 2009 when Trump licensed his name to Ideal Health, a multi-level marketing business founded in 1997 by Lou DeCaprio and brothers Scott and Todd Stanwood. Ideal Health invited independent salespeople to do their own marketing to sell a customised vitamin supplement package, which was determined by conducting urine hormone tests using the company’s signature product, the PrivaTest. But experts questioned the test’s medical value. “Urine tests do not provide a legitimate basis for recommending that people take dietary supplements,” wrote Quackwatch founder and retired psychiatrist Stephen Barrett in 2003. 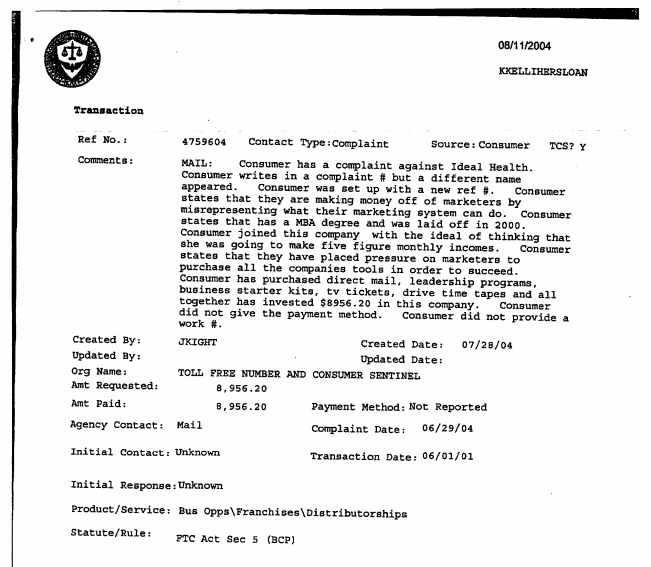 Barrett later speculated that Ideal Health had acted illegally by falsely claiming that the PrivaTest could “improve” and “support” physical and mental health. 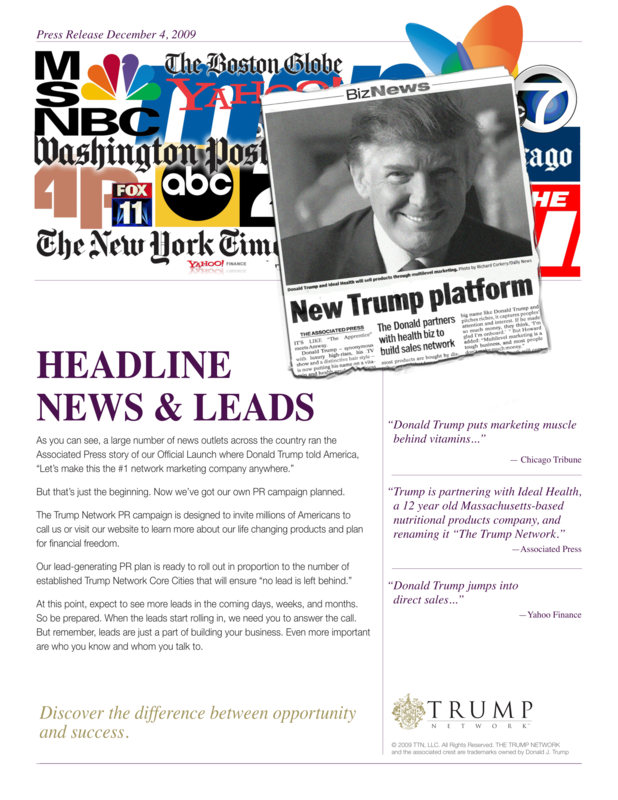 That didn’t stop Trump hawking branded PrivaTests on the now-defunct Trump Network website, where they sold for a whopping $139.95 per box. Speaking to STAT in 2016, executive president of The Trump Organization Alan Garten said that Trump “was endorsing the idea behind the business” but that his role “did not amount to an endorsement of the products” themselves. However, in a “personal letter” published on the Trump Network site, Trump appeared to give his stamp of approval. In reality, the job of promoting the company was largely left to independent marketers via “personal self-replicating” sites and other, more innovative methods. 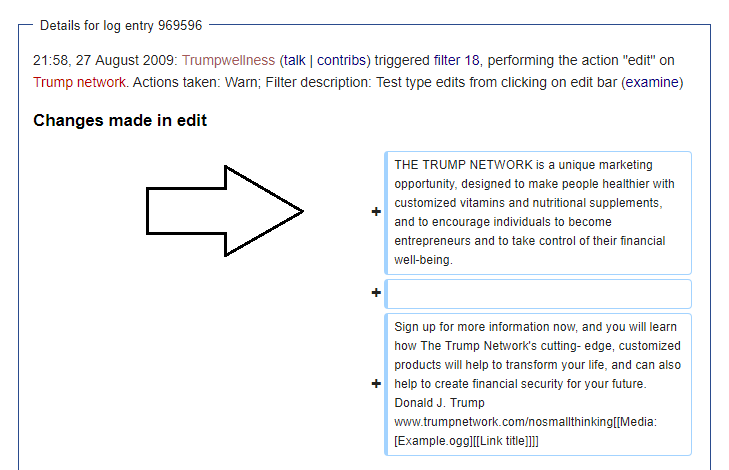 In one misplaced attempt at viral marketing, a Trump Network recruit used Google Books to issue a press release under items relating to Trump. Curiously, the author of the release gave only modest ratings of Trump’s books. 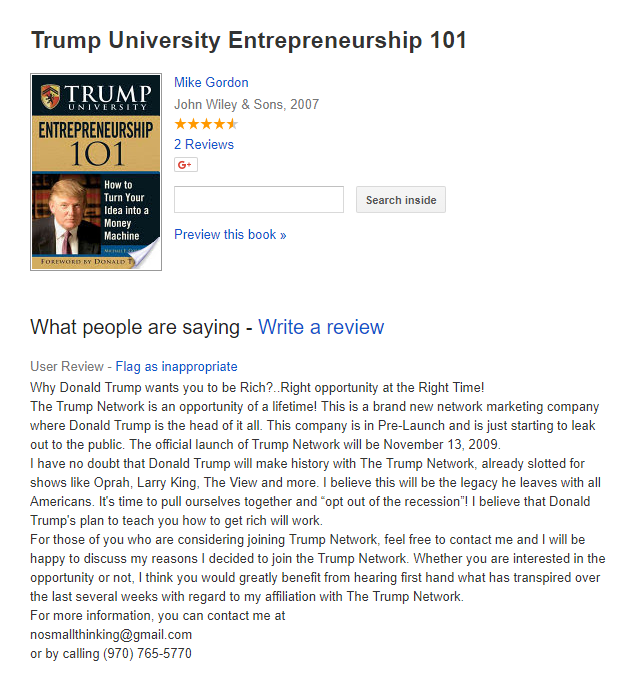 One book, Trump: Think Like a Billionaire, received a meagre two stars. Another innovative way marketers sought to enlist new recruits was by speaking to them directly using online forums. Going by some of the responses, this approach might have worked. But as the company fell into decline, pending lawsuits and accompanying PR disasters, it too failed to take. 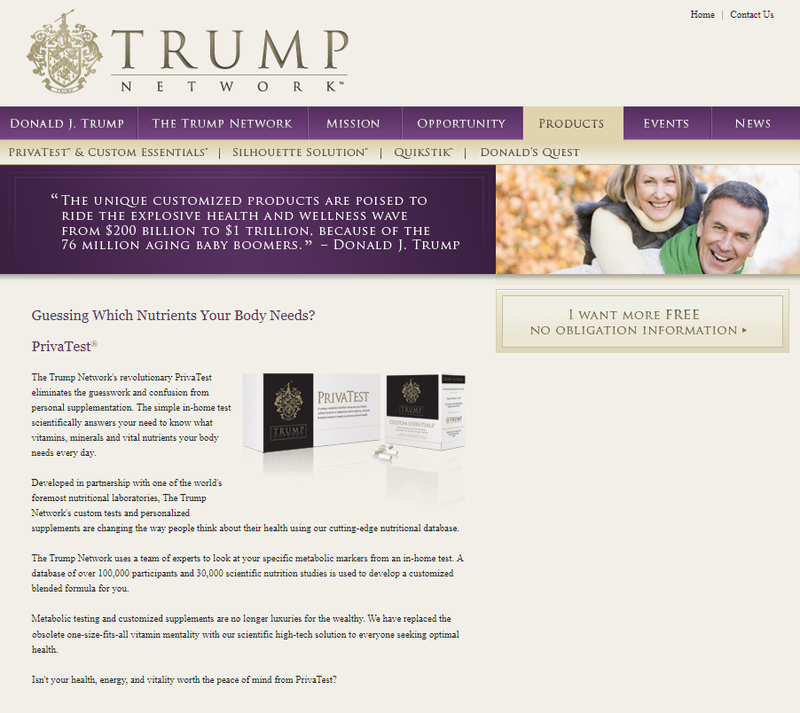 In 2011, Trump’s licencing deal with Ideal Health expired and was not renewed. The assets were then sold to a “health and wellness” company named Bioceutica, which still sells the now-rebranded Trump Network vitamin packages and urine tests.